First impressions count, and the open cab area, airy interior, LED lights on the stairs, smart seats, no noisy air chill and a solid feel gave great encouragement. Then we started to move, and things got even better. Excellent suspension, not a rattle to be heard, and the smoothest brakes you could wish for. Sadly I couldn't get any interior shots but several things stood out. Firstly screws hugely outnumber rivets, meaning everything can be kept tightened up. The hand rails had a design I haven't seen before meaning rattling is virtually impossible. The opening windows are inset into larger windows again aiding the feel of solidity, and I realised fairly quickly that this was a nice place to be. We didn't reach Warp Factor 9 as the X1 needs to do (damn I knew I'd fail) but that would be sorted if a fleet was purchased. However I wouldn't be doing my job if I didn't mention one or two albeit minor quibbles. My old pet hate of destination screen access flaps rears its ugly head again. In time it will rattle - no doubt about that so my plea for rubber seals is repeated. Very simple yet would make such a difference. The legroom wasn't great, but I assume any ordered for the X1 would have a different spec. That was about it, except the bell was difficult to hear upstairs. No such problems with the bus's horn though, which is spectacularly loud! No review is complete without the driver's view, and our driver was happy to give her opinion. She said it was lovely to drive, lovely to brake, felt solid and well made but had one big problem - she was unable to see the dash instruments through the steering wheel regardless of the position she had the driver's seat in. I will be interested to know if any of the Ensign drivers have made similar comments. 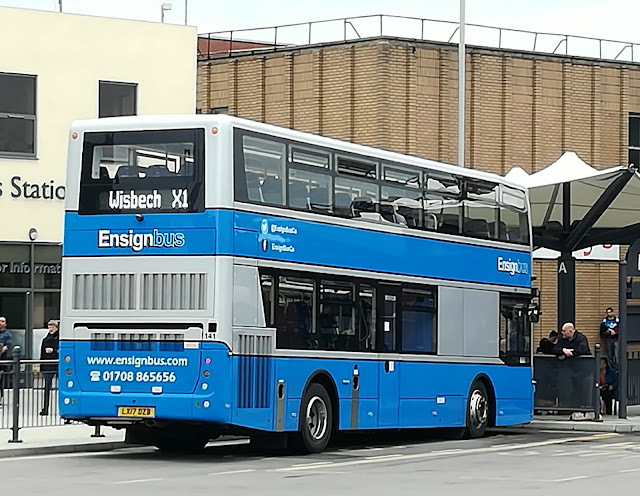 Thanks to Ross Newman of Ensign who has kindly answered my questions today, I can inform you the Enterprise costs around £220K, which is slightly more than a standard E400MMC but my word you notice the difference. That price includes shipping, not from Australia it transpires but China, where the bus is actually built. There is also a tri-axle version, with a much beefier Cummins 8.9L engine, air conditioning and seat belts, which Ensign are loaning to First sometime in August. That version is considerably more expensive, but Ross assures me the difference is well worth it. I can't wait to ride it. Part three of the road trip will be up soon. 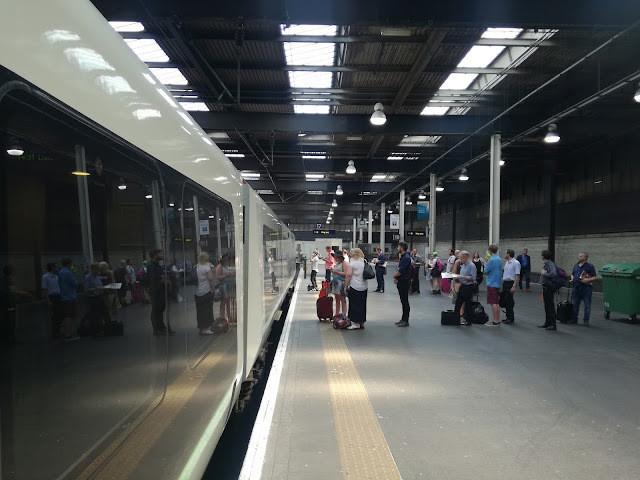 In Part One I had survived the sauna at Euston provided courtesy of Mother Nature and London Midland, and arrived at Crewe to be met with a level of humidity I've only previously experienced at Miami Airport. However I only had a couple of hours there and needed to make the most of it, and opportunity knocked immediately. Standing on platform 12 was none other than the Flying Banana itself, Network Rail's New Maintenance Train, or The Holy Grail as it famously became known on Trainspotting Live last Summer. I've spent many hours watching Railcam's Crewe cameras and it was good to be able to walk the platforms and put things into perspective. It's a big station, and the platforms stretch out in both directions. 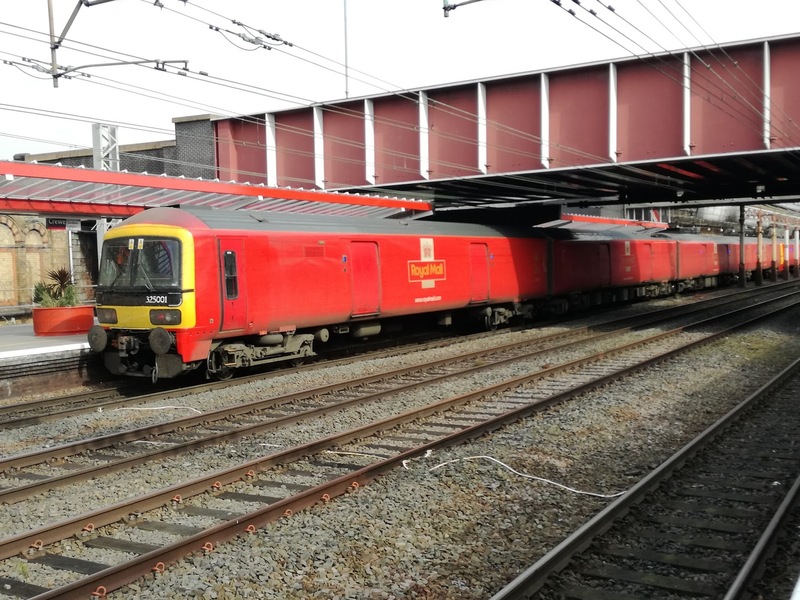 Many operators run trains through Crewe, and I managed to snap a few of them. A spare loco is kept at various locations on the West Coast line ready to rescue failed trains to get the line unblocked asap. Known as Thunderbirds 57302 was at Crewe, thankfully not needed. 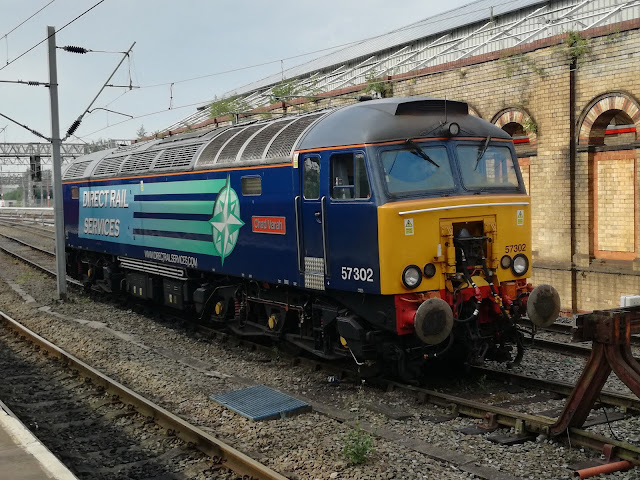 57302 ready for Thunderbird duties if needed. 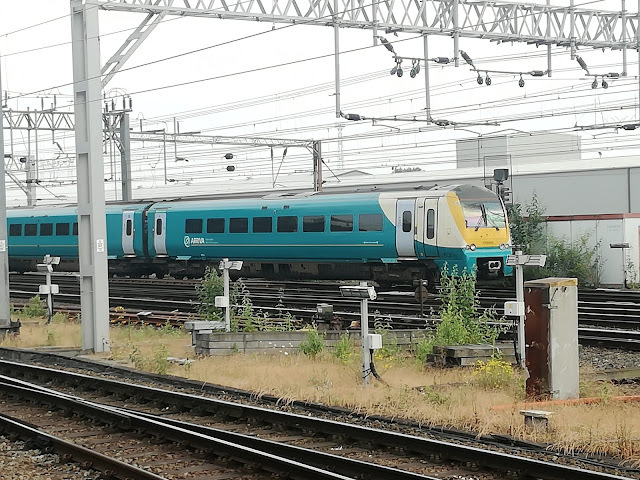 Arriva Trains Wales also pass from Crewe. On Wednesday due to problems at Carmarthen their services were much delayed, but I did managed to snap at distance this 2 car 175. 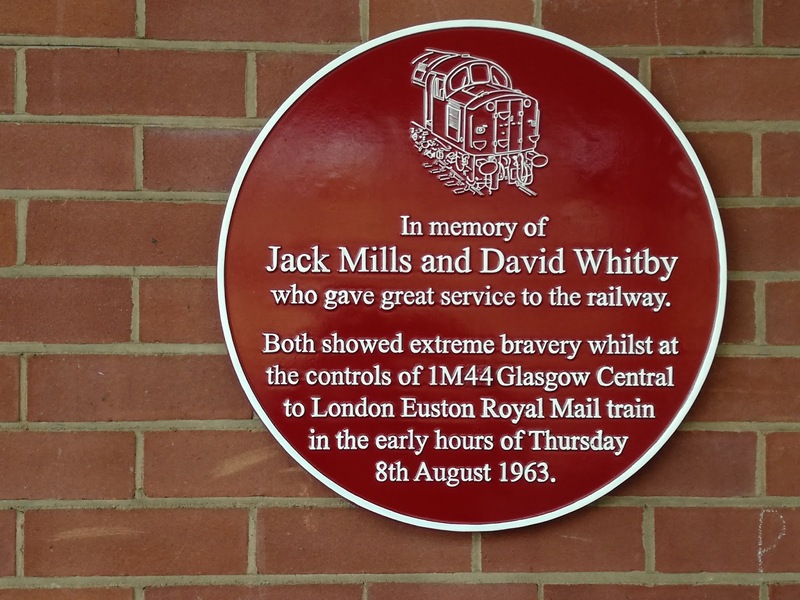 While exploring the station I wandered along the seldom used by passenger trains platform 12 and came across this commemoration to Jack Mills and David Whitby, who were the train crew victims of the Great Train Robbery in August 1963. 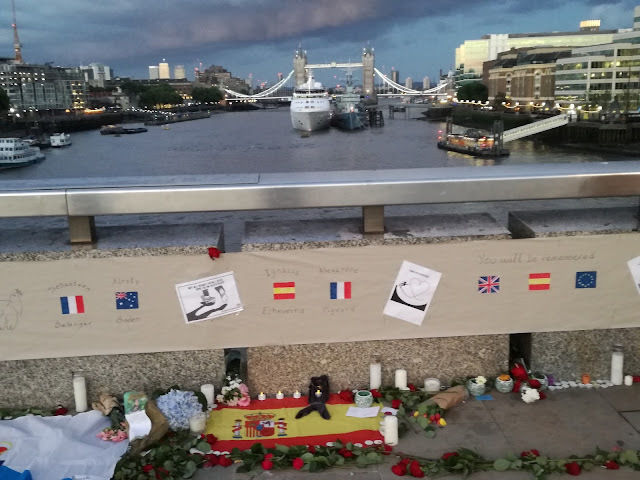 I find it rather sad this memorial should be on a platform where few will get to see it, and suggest it would be a nice touch to relocate it to Platforms 5 or 6 where far more people will be able to see it. I hope someone with influence reads this and takes the idea forward. After a rather nice tea it was time to continue my journey north to Carlisle, and another first for me. 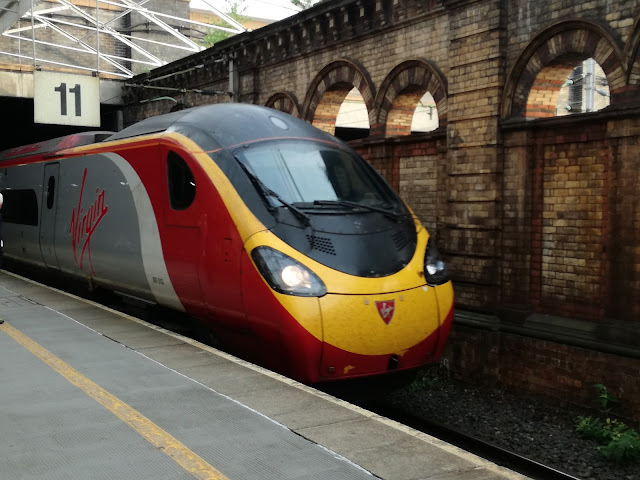 I have never been on a Class 390 Pendolino before, and was interested to see how they measured up against other high speed trains. My first impressions weren't great. An unusual layout, narrow windows and from what I could see no charging points. They certainly motor along though, in no time we were doing 125mph yet it reached that speed without the raw power of the Hitachi Javelins. Then things started to improve. Firstly the train started to empty out, and they are much nicer trains when not packed, which seems obvious, but some trains are better with a full load than others. Then a saint on Twitter told me the table seats had power sockets and all was good with the world again. I started to like the trains - the tilting on corners is rather impressive - and began to imagine something similar on the Great Eastern line. Sheer fantasy I know but one can dream. 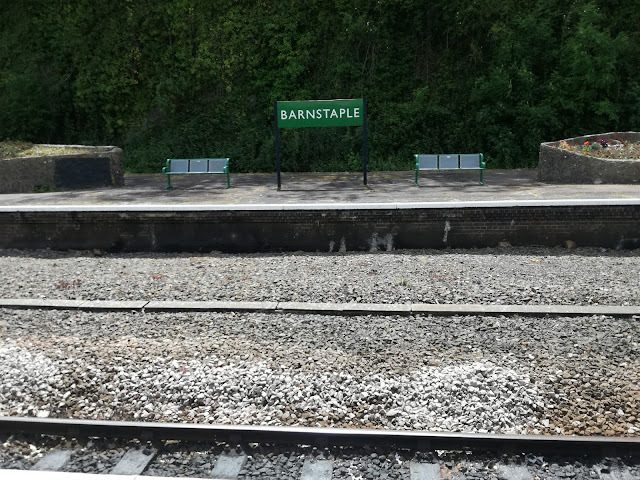 Just one quibble - despite being on the train over two hours my ticket wasn't checked, and no barriers in operation at either end. Anyhow we soon arrived at Carlisle, and the night shift began. 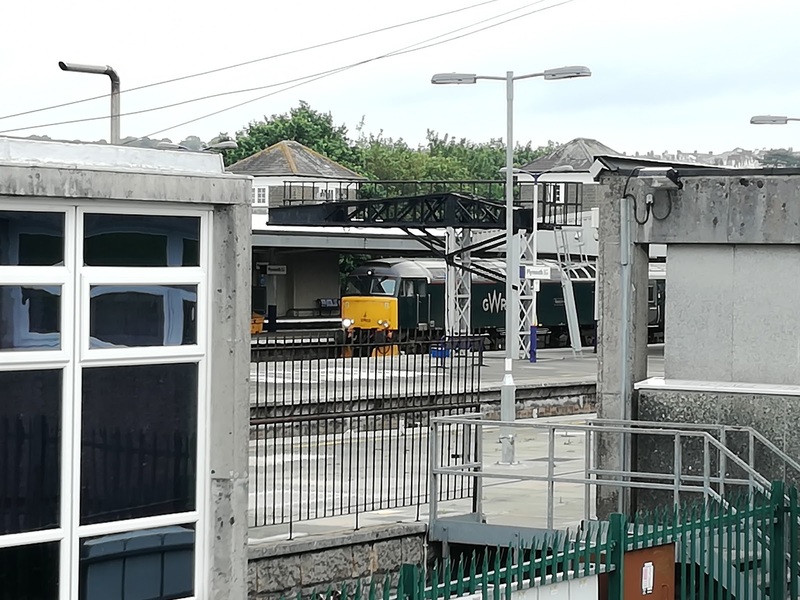 Carlisle station is undergoing a big roof renewal at present and it's surprising there is any scaffolding left for the rest of the country. This means navigating around the station is pretty difficult. I was advised to find the night Team Leader to tell him I was going to be on the station all night and he couldn't have been friendlier. Just asked me to observe the usual protocols but apart from that I could do what and go where I liked. He did advise me, though that the toilets were shut until morning, so I ventured to a local hostelry to use the loo and stock up on water for the night as it was still extremely hot and humid - which has got to be rare for Carlisle at 11pm. 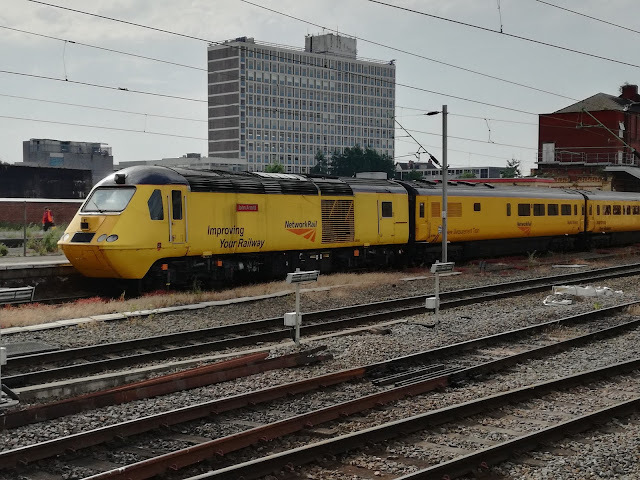 I'll be posting the videos I took at Carlisle at the end of the final part, but suffice it to say I saw far more Class 90's than 66's, realised just how loud for electric loco's Class 92's are, and 37's look great at night. 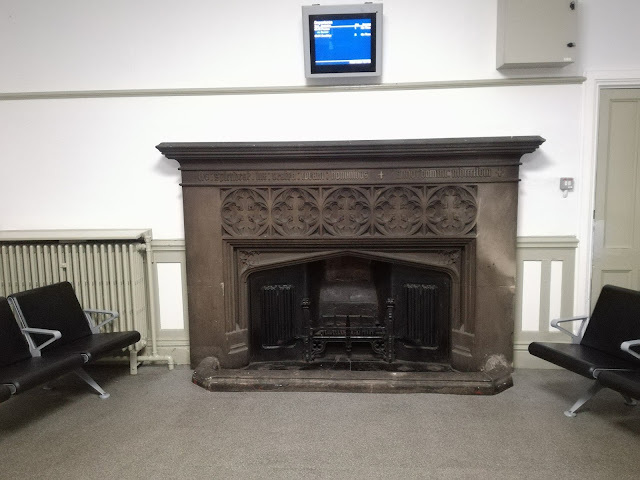 However for now I'm going to concentrate on Carlisle station. This will not be the last time I go there. It's an incredible place, with so much to look at apart from the trains. I didn't take nearly as many pictures as I should have of the exhibitions on the platforms for the Setttle & Carlisle line, and the Cumbrian Coast line. Timetables and attraction leaflets were ubiquitous in their availability, and I cannot wait to return when the scaffolding has gone and the station is back to what must be a stunning building. However, something I have never seen at a station before was awaiting me, and it couldn't have been more welcome. Carlisle station has padded seats on the platforms, which when you are about to embark on an all nighter is an absolute Godsend. And so the all nighter began. I tried to take power naps between trains, but one thing did distract me from my slumber. There were some Northern Trains units behind me and were cleaned overnight to an astonishing standard. One guy did the lot from topping the toilet tank up, to cleaning, hoovering, sweeping and mopping the entire train. Then cleaning windows, tables, driver's cabs the lot. Impressive stuff. 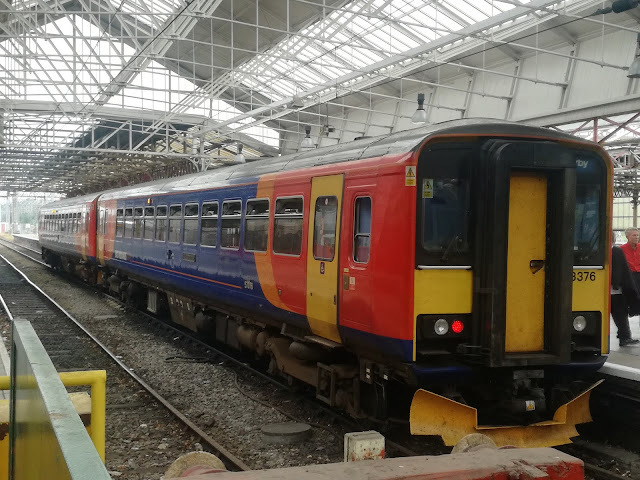 Around 2am after the first London bound sleeper had gone a member of station staff (Darryl) came up and asked if I was ok. By this point the old bladder was starting to complain so he pointed to the train currently being cleaned and told me to use the loo on that. Excellent. 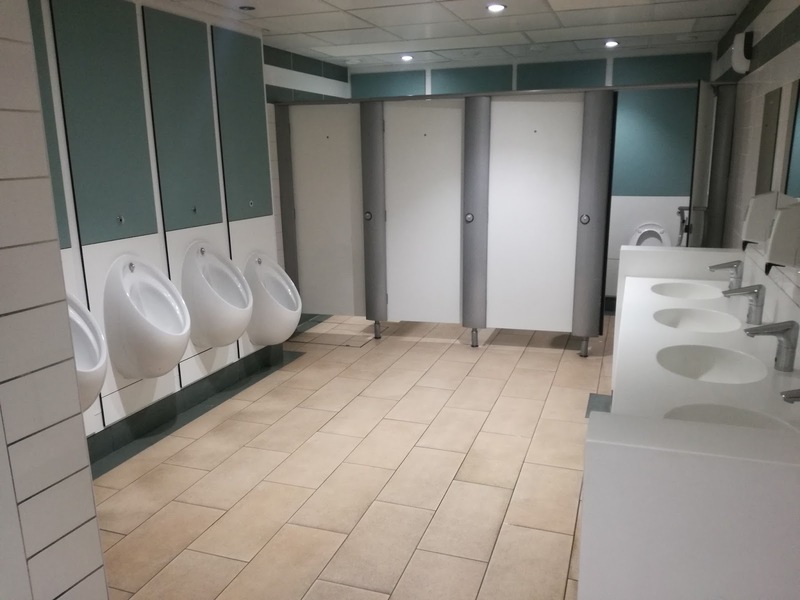 An hour later he was back, and told me they had unlocked the Gents loos for me if I needed them, or to have a wash and brush up. He asked me what I was doing next, and I told him I was getting the 0515 round the Cunbrian coast but was a little concerned where I could charge my phone up as the Mk II's don't have power points. Darryl told me to follow him, and promptly unlocked the waiting room which had power points in it. What a nice guy, and what a contrast to the Euston experience. And what a waiting room! Is there a more magnificent fireplace anywhere in the country in a station waiting room? At the other end is yet another display for the Settle and Carlisle line. You cannot get bored waiting for a train at Carlisle! Now this trip was a trip of firsts, and here is another one - I have never felt compelled to take a photo of a gents loo before. But I was so bowled over by these at Carlisle I just had to. I'm sure everyone remembers how station loos used to be, and in a lot of cases still are, so to enter these which would grace any top class hotel or restaurant was a revelation. I fell in love with Carlisle roughly 20 minutes after arriving there. The friendliness of not only the station staff but everyone I encountered was wonderful, and I cannot wait to return. I even managed to buy my Cumbria Rover ticket from the ticket office at 5am! Yes the ticket office opened at 5am which is quite remarkable. 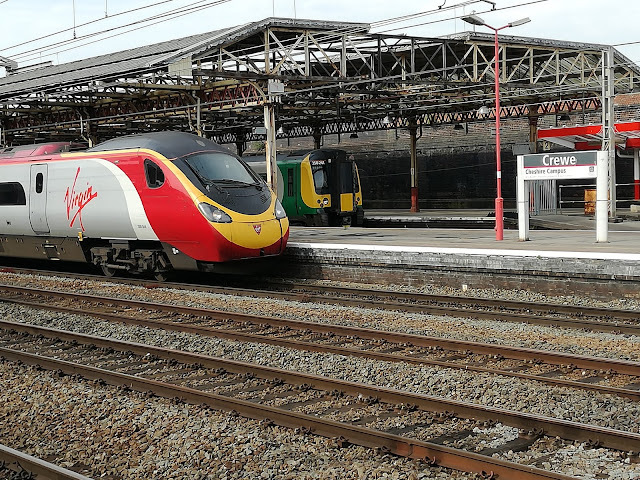 But special mention must go to Darryl, and the night team at Carlisle, who are a credit to Virgin Trains, the City of Carlisle, themselves and the industry as a whole. I can't thank them enough and look forward to returning in the future. 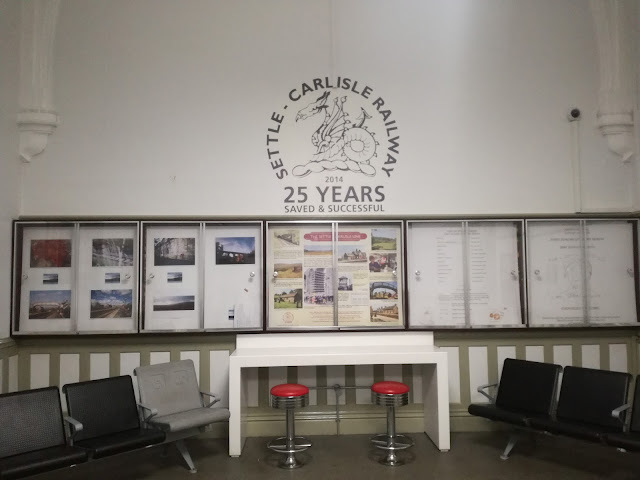 In Part Three the journey continues with the best part of 8 hours behind a 37, and my first trip on the Settle & Carlisle line. Ok a bit of headline licence there as it was actually 61 hours but another road and rail trip for relative peanuts with many firsts for me and just as many boxes ticked. I have no idea how many parts I'll need for this as I crammed quite a bit into a very short space of time, and saw the best and the worst of the industry. 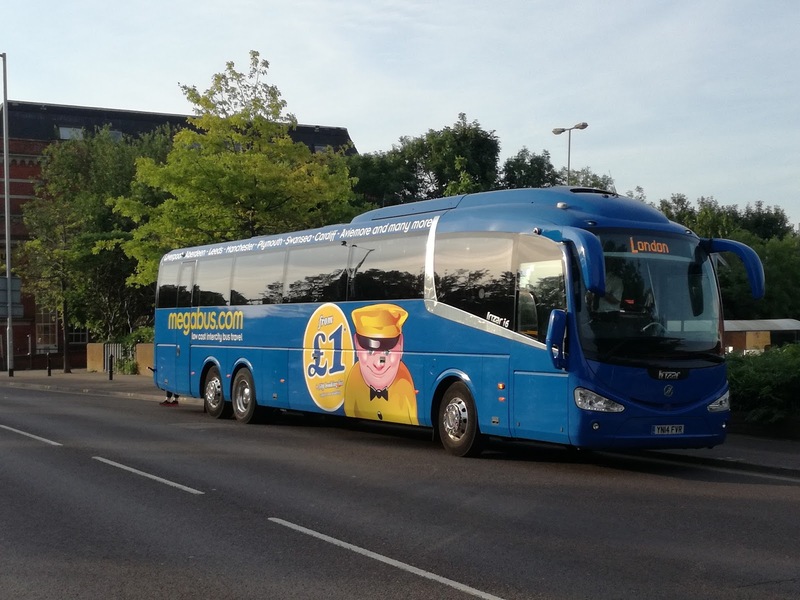 It started, as is normally the case with Megabus from Norwich to London. Once again I had my favourite Scania Irizar, and this time I was able to get a pic to do it justice. Quite something to think it is cheaper to travel on that coach than it is most E200's, in fact on the way back cheaper than any bus. Anyhow our decent driver reminded us that Wednesday was the State Opening of Parliament and due to road closures it might be quicker if we got off at Stratford and made our own way into Central London. Surprisingly few took his advice, but it made up my mind what I was going to do with the spare 4 hours I had before catching the train to Crewe. The heat was going to play a factor, and buses were certainly out. 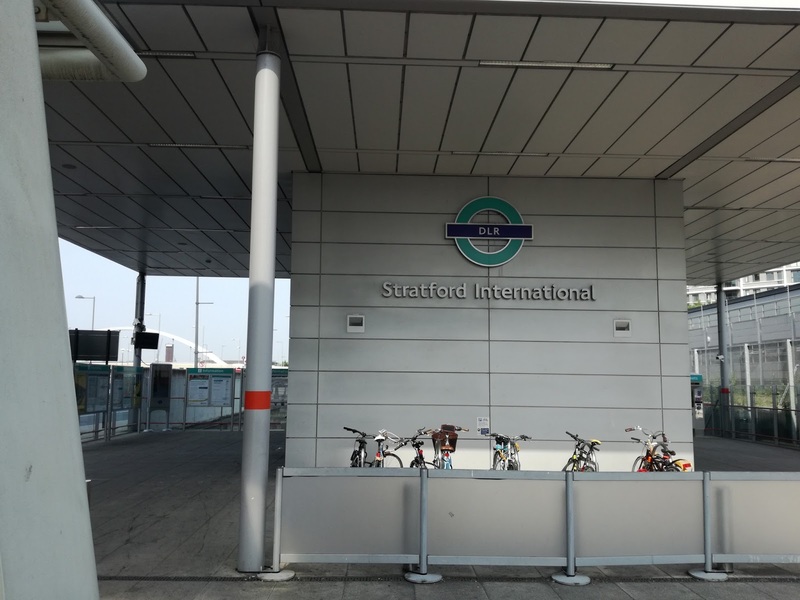 So I crossed the road, topped up my Oyster card, and prepared for my first ride on Docklands Light Railway from Stratford International Station. 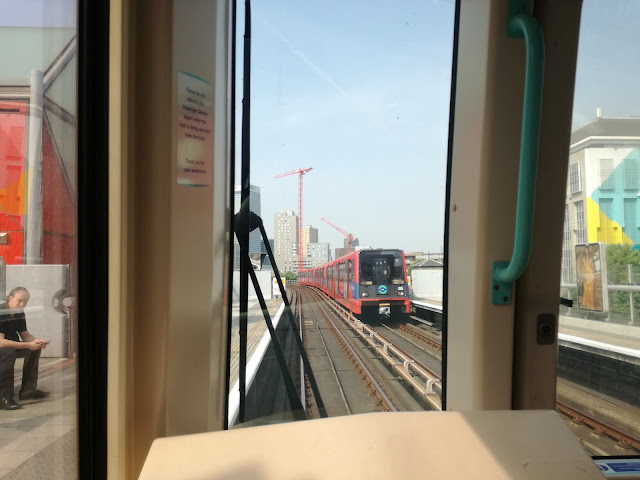 Normally on DLR it is easier to win the lottery than it is to bag a front seat but on this occasion they were empty on both trains I travelled on, so you get a view rarely seen from a train, and it makes all the difference. 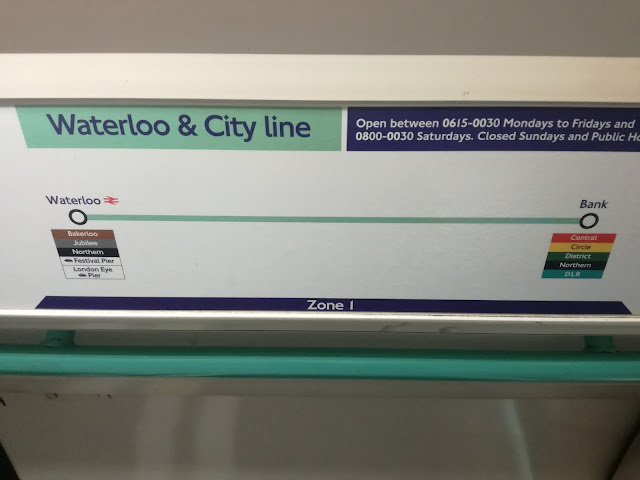 I ended up at Bank station, wondering what to do next when I saw signs for the Waterloo & City line. The last time I travelled on that line it still had Network Southeast liveried trains on it. Now TfL have taken over and it is now the shortest Tube line there is. 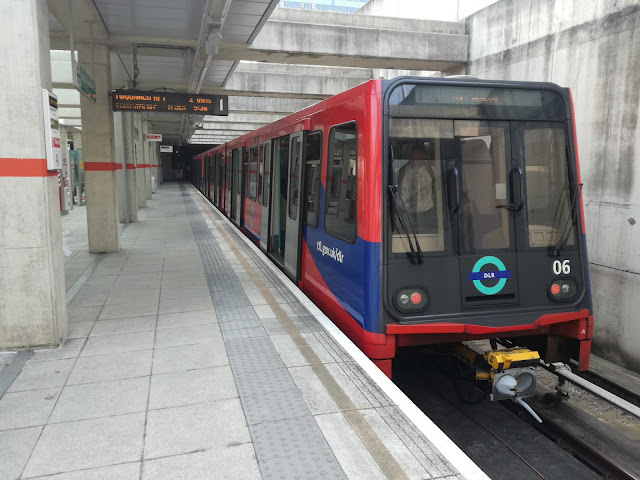 3 car modern tube trains are on the line, which takes around 5 mins from end to end. Now at Waterloo in the middle of a fashion circus with Royal Ascot on - hat shops did very well this week it seems - I got a zone map and worked where I could go, hopefully on a type of train I hadn't been on before. 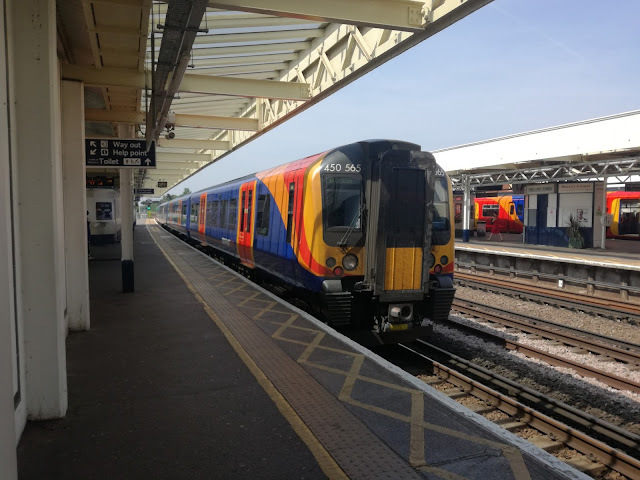 Cue the 1053 to Alton and a South West Trains Siemens class 450. For what is essentially a commuter train with 3+2 seating these are lovely trains. Fast, quiet, smooth, outstanding air conditioning which was most welcome, and comfortable seats. Thoroughly enjoyed my journey to Surbiton in Surrey. 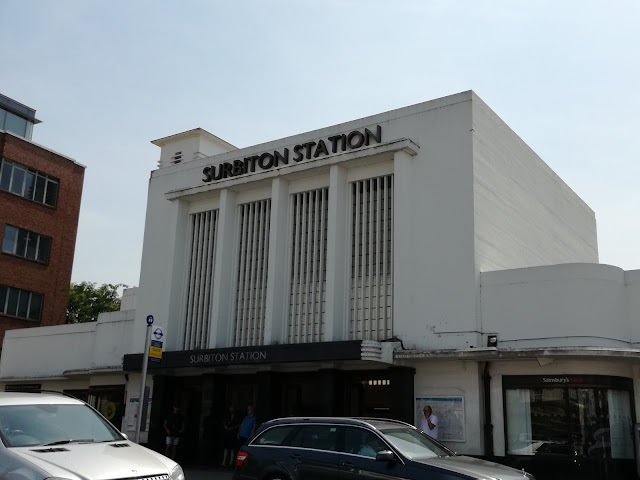 A wander then lunch in Surbiton, where I had most certainly not intended to be in the original plan, then it was back to Waterloo from this quite outstanding station building. Another deliciously cool 450. 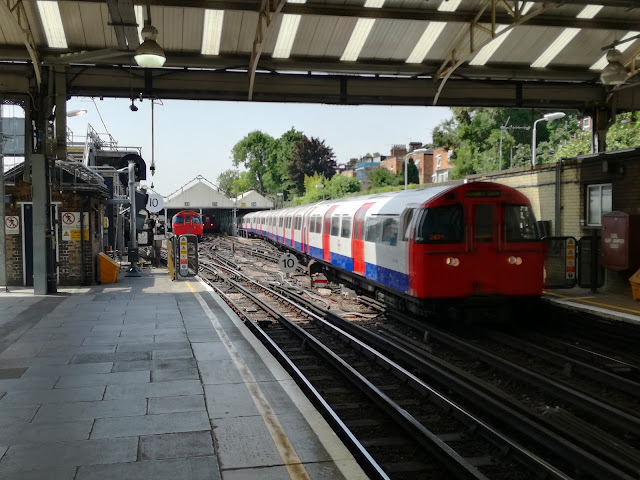 I had hoped to avoid using any more Undergound due to the heat, the plan being to go back to Clapham Jct, then on Southern via Kensington Olympia to Wembley Central to catch the train to Euston from there. 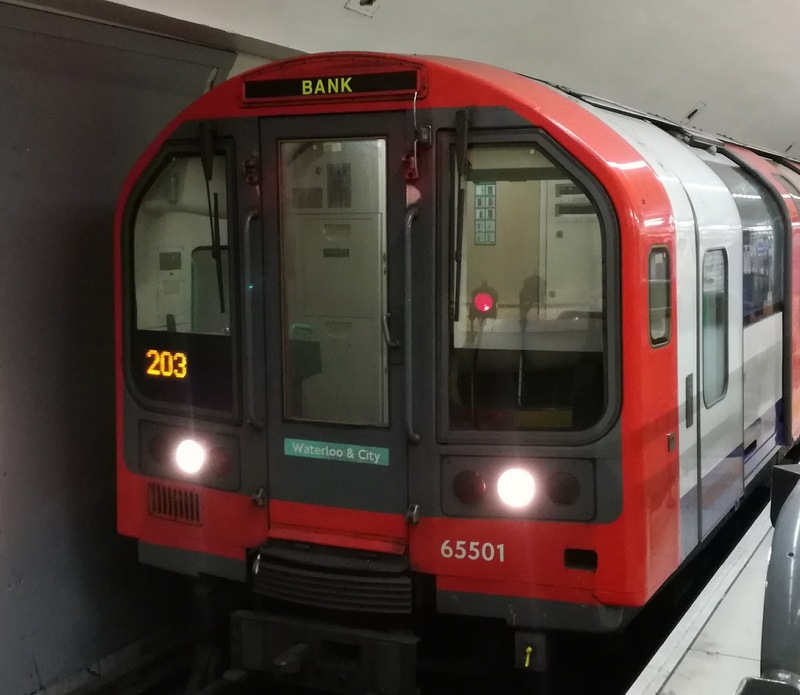 However a check of the timetables ruled that out so the Bakerloo line it was, hoping the Bake would be kept to a minimum. Unlike a lot of Underground lines, the Bakerloo is still fairly quiet off peak, so the journey up to Queens Park wasn't as bad as it could have been. Plus, of course, you have the oldest trains still left on the Underground network. It was then time for another first, as I got my first journey on a London Overground Class 378. These are basically Electrostars with an all side seating Tube style layout. With air conditioning. 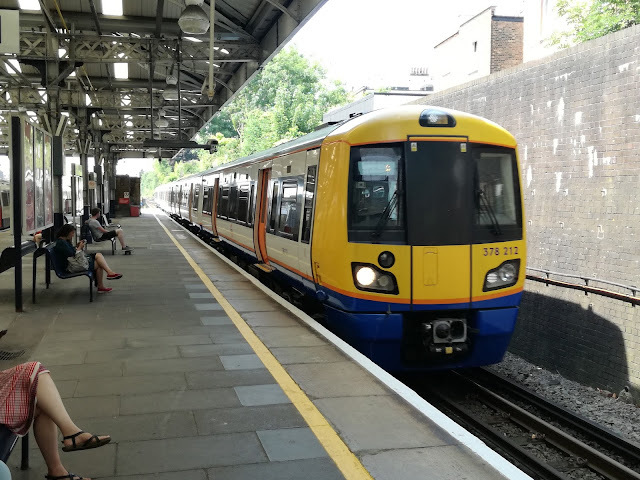 On Wednesday, with the outside temperature getting to the silly stage of heat the aircon was a Godsend and dwarfed any petty moans I had about the trains. I don't really like side seating as you spend your time trying to avoid eye contact with other passengers, and can see little out the windows without getting a stiff neck. And who chose the seat moquette! 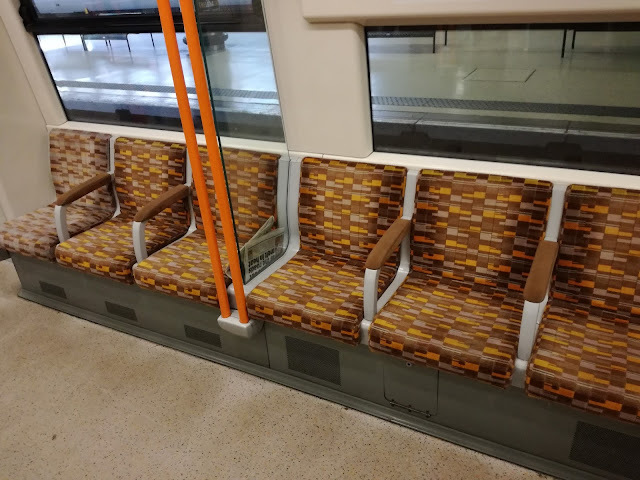 Straight out the 1970's, not far removed from the original D Stock District line trains moquette. But who cares! It was air conditioned! Now at Euston and what turned out to be the most unenjoyable hour not just of the trip, but quite possibly my travelling life. Euston was an oven on Wednesday. I was booked on the 1446 London Midland service to Crewe. I had noticed that the passengers on the 1346 had only been let on the train just before the train left, which I put down to the crew being held up on the inward journey. However that wasn't the case. 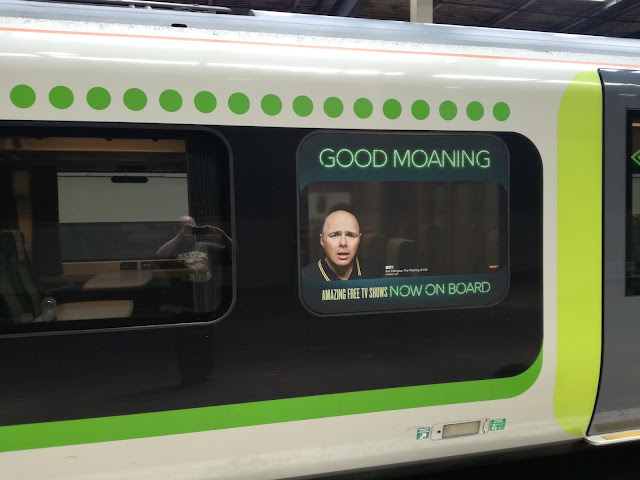 Thanks to Real Time Trains I found out which platform the 1446 was booked from and waited, as although I had a 1st class ticket there were no seat reservations and only 24 1st Cass seats, 8 of which had windows blocked by vinyls and Karl Pilkington staring down at them. The temperature was getting very uncomfortable, but the doors remained firmly shut. 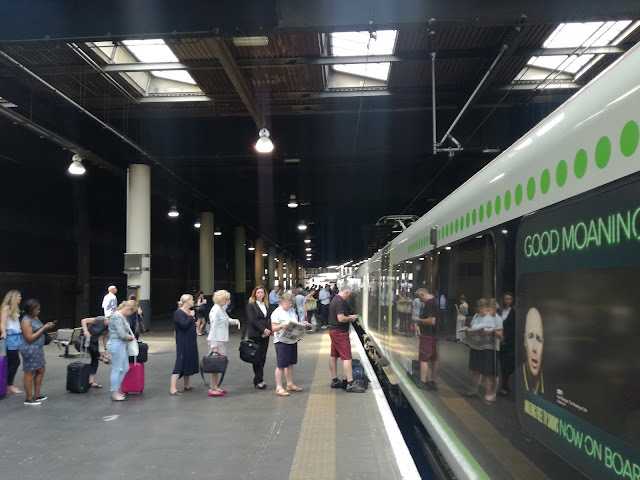 With half an hour to go before departure the train was advertised on the departure boards and others arrived, forming queues at every set of doors, With fifteen minutes to go it looked like this. With 5 mins to go you can double what you can see in the pictures and more. Tempers were getting frayed, people were complaining of feeling faint, and one elderly gentleman kept telling me to press the door button in case they opened - like we were all standing like numpties on purpose! At 1443 the doors were opened. I have no idea how much sweat was absorbed by those seats on that train. I'm not sure I want to know. What I do know is it was customer service at its absolute worst. Had animals, or indeed a class of school children been left to swelter in that heat there would be prosecutions, and rightly so. When I Tweeted London Midland I was curtly told it was procedure not to open the doors until both crew members were there and that was that. Tough, in other words. No apologies from anyone, no one asking if everyone was ok. We've got your money and that's all that matters seemed to be the attitude. Rest assured I will be taking this further, to the Rail Regulator if I have to. Not to make allowances for the conditions was downright criminal, not to mention cruel. No mention of security either, in case anyone thinks that was the reason. The journey itself was great, the 350 gave a fast, decent ride, although I was disappointed tickets were only checked once on the entire journey, that being just after Euston, to add insult to injury, and it appeared many who subsequently sat in 1st Class didn't have tickets for those seats, if tickets at all. Again not good enough. 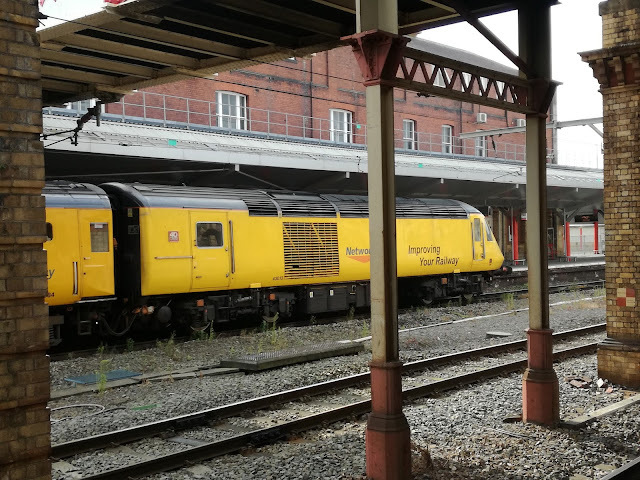 But we finally arrived at Crewe on time to be met with a level of humidity I've never experienced in this country before. In Part Two 3 hours at Crewe, a night at Carlisle, and in complete contrast the best customer service you could ever ask for. 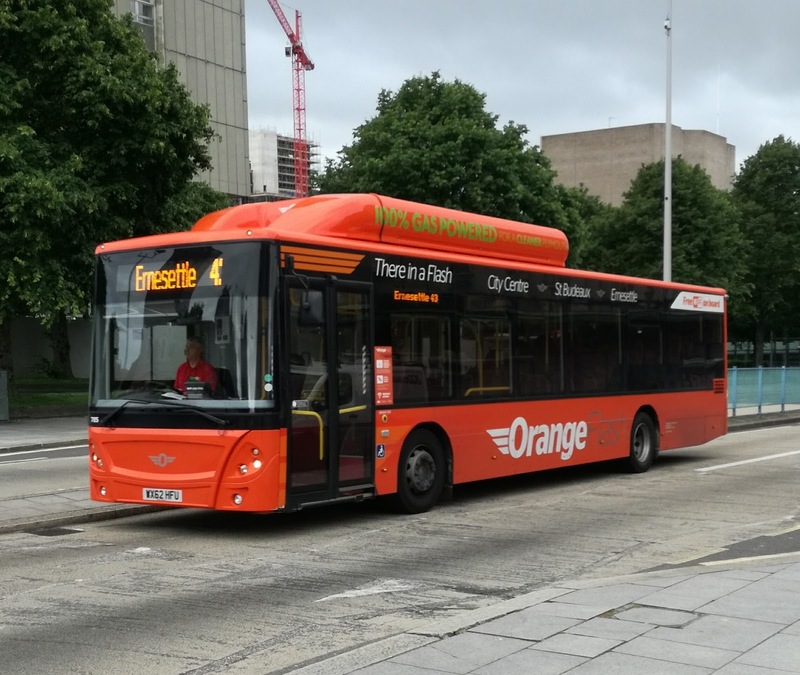 In Part One I travelled to Plymouth via London to catch up with the former Anglian gas buses, which turned into quite an anticlimax. 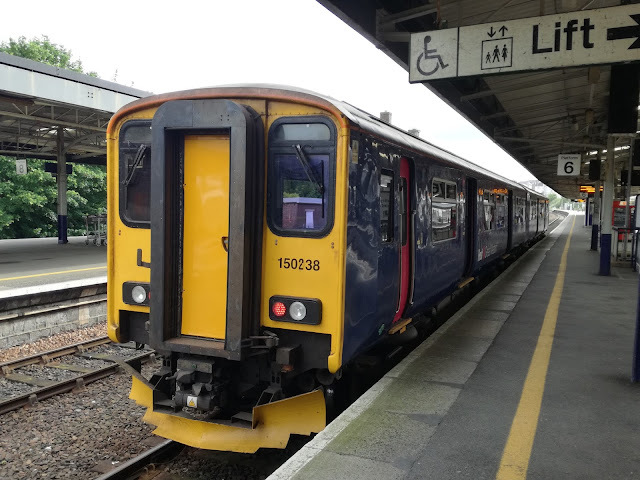 The rest of the day was spent getting the most of what has got to be one of the best value train tickets around - the Devon Day Ranger. For £12 you get the freedom of Devon's railways from Tiverton Parkway in the East to Plymouth in the West and all branch lines within. 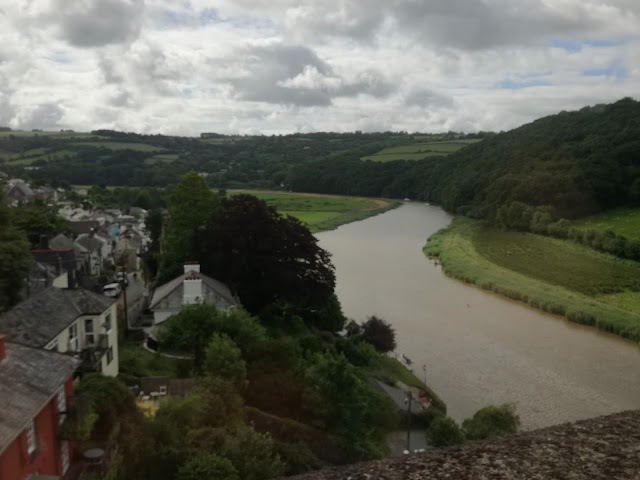 I started with the 0840 along the Tamar Valley Line to Gunnislake, completely oblivious to the jaw dropping railway landscape that awaited. Traction was a 2 car 150, which is basically a 156 with a different layout. To say the Gunnislake branch is spectacular is doing it an injustice. After passing the naval dockyard the line follows the river offering some cracking views. This was just a foretaste though. 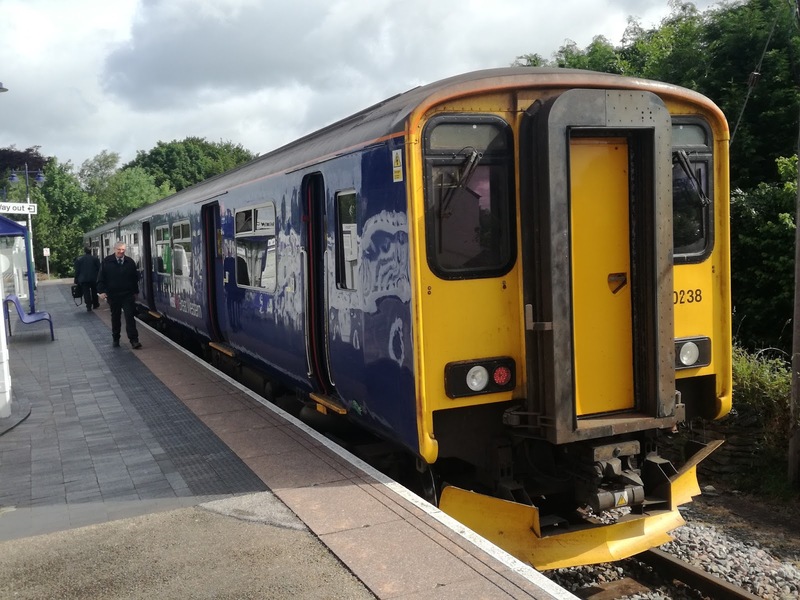 At Bere Alston the driver changes ends and the train reverses out for the climb to Calstock and Gunnislake, and when I say climb I mean climb. I have never travelled on gradients like this on non preservation lines before. 10mph limits on winding lines climbing up through dense woodland. The only line I have been on that comes close to resembling it is the Ffestiniog Raailway in North Wales. One thing sprung immediately to mind - that line has got to be Hell in leaf fall season! The driver confirmed that when I grabbed a few words with him back at Plymouth. 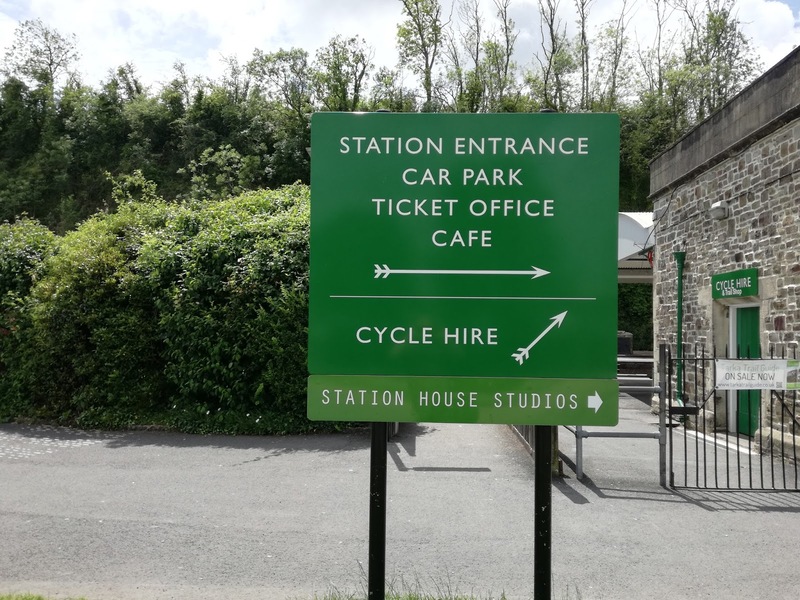 It was a quick turn round at Gunnislake, which is actually in Cornwall, which was a shame, but what goes up has to go back down, and down we did go. It will not be the last time I do that line. Only 14 miles long but surely 14 miles of the best railway you'll ever go on. I'd kill for a cab ride! That more than made up for the disappointing gas buses but there was much more to do. 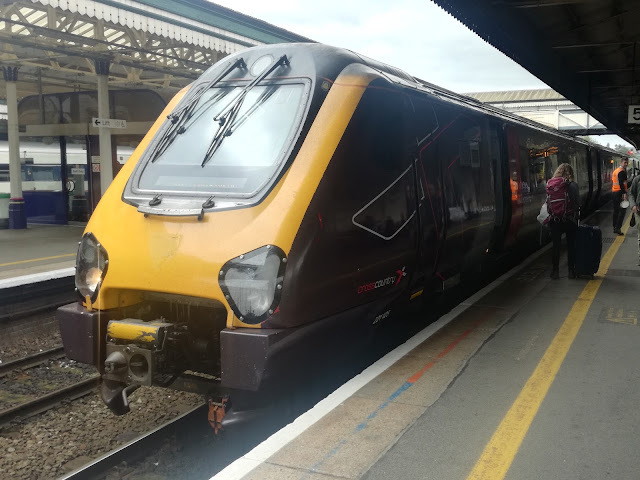 I jumped on a Cross Country Voyager for the trip along the South Devon coast to Exeter. A long time since I've been on a Voyager, and despite the interior looking a bit in need of a freshen up the ride was smooth and sleep inducing, so I saw little of the aforementioned coast! 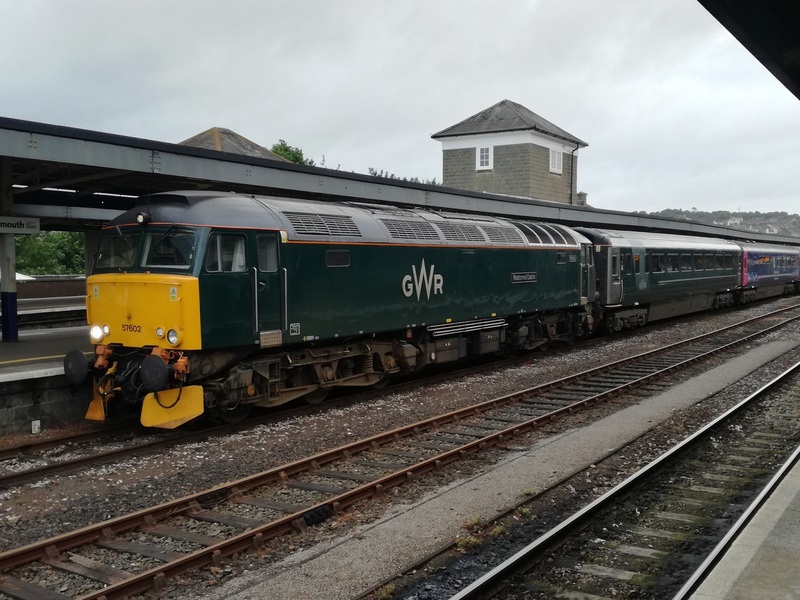 Luckily I woke up before Exeter as that particular train was carrying on to Glasgow, which for some reason isn't included in the Devon Day Ranger! 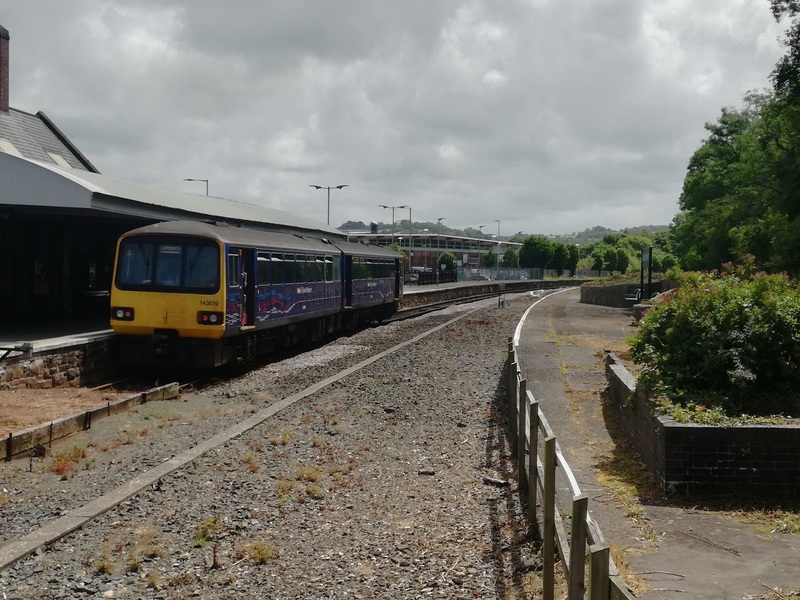 My next destination was Barnstaple, along another branch line, and this time I got my first taste of a Class 143 Pacer, the scourge of the North. It was over an hour to Barnstaple and by time we got there my backside was beginning to feel the pace of the Pacer a bit. They aren't nearly as bad as I was led to believe. Yes the suspension appears to have been forgotten in the design, and yes it rattled a bit, and they are getting on a bit like yours truly, but for branch lines like this they are ideal. 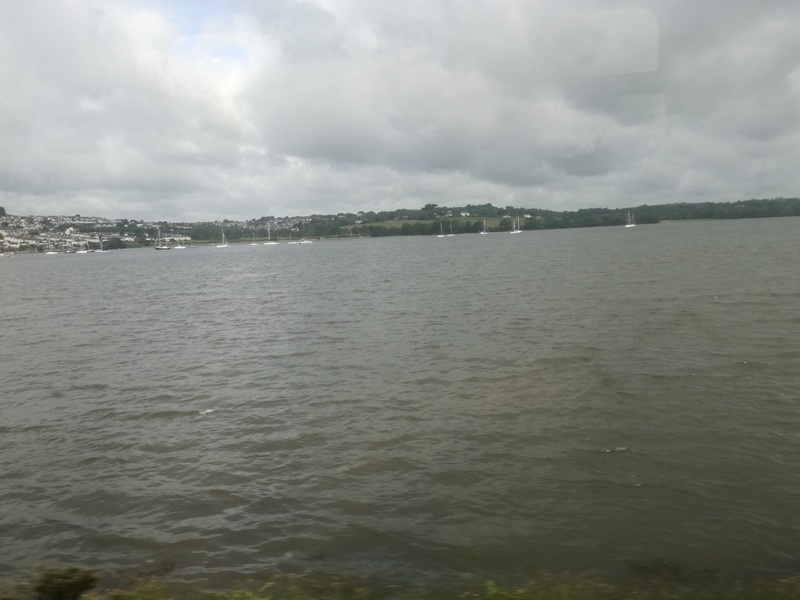 The line itself wasn't as spectacular as the Tamar valley Line, but pleasant enough. I decided to make Barnstaple my lunch stop, and so walked into town to see what there was. There was a bus station! Stagecoach seem to rule the roost in these parts with the odd independent. Next time I visit I'll do some bus exploring. After an excellent lunch I returned to the station which has some nice quirks about it. And this the quirkiest/daftest of all. 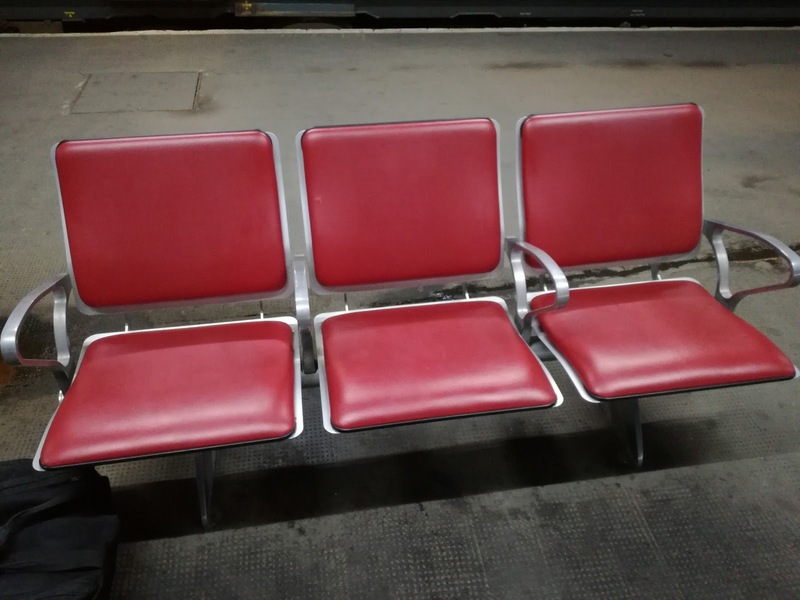 This picture got some of the great and the good in the railway media world debating if they were the most pointless seats left on the network. The platform is closed to the public so who are they intended for? Answers on a postcard, and if anyone knows of other pointless seats let me know! 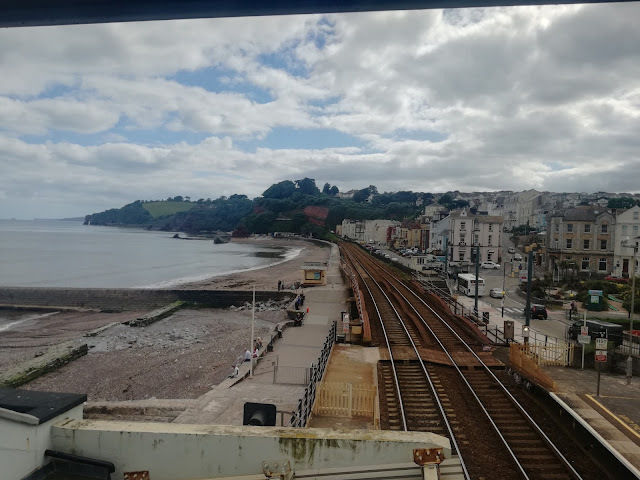 Back in Exeter and it was time to retrace some memories and embark on a pilgrimage to Dawlish, surely the Mecca of the train enthusiast's England. A 143 was attached to a single car 153, and I chose the latter for the better seats. 20 mins later we were in Dawlish, where I hadn't been for 15 years but a place I watch regularly thanks to the excellent Dawlish Beach webcams. Felt a bit like going home. 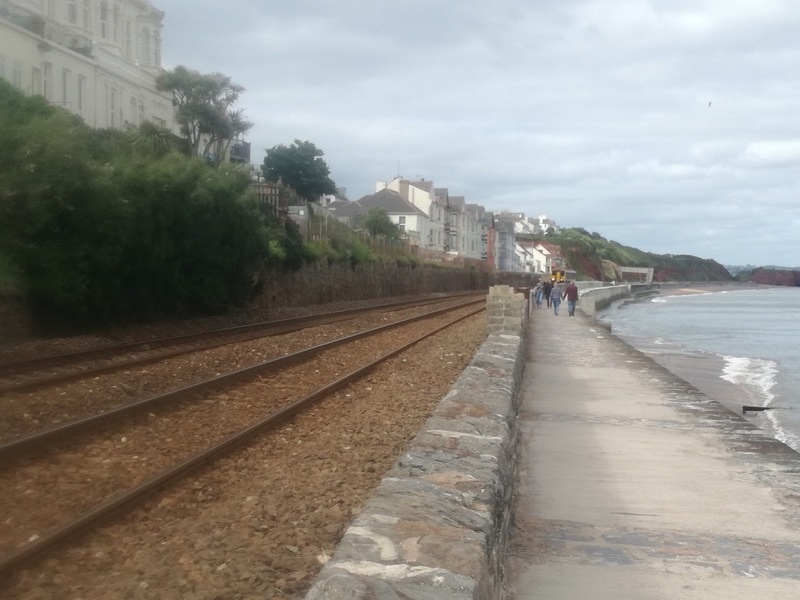 I don't know anywhere you can get closer to mainline moving trains without high fences than Dawlish. Stations excepted obviously. Dawlish sea wall runs from the far end in the photo above to Dawlish Warren, and after making sure the quality of ice cream in Dawlish was as good as I remembered (it was), I ended up walking the entire length of the wall, something I truly regretted later due to my choice of footwear - suitable for travelling but definitely not for extended walking! At the end of the post will be a compilation of the videos I took on the day, so the trains will appear there! 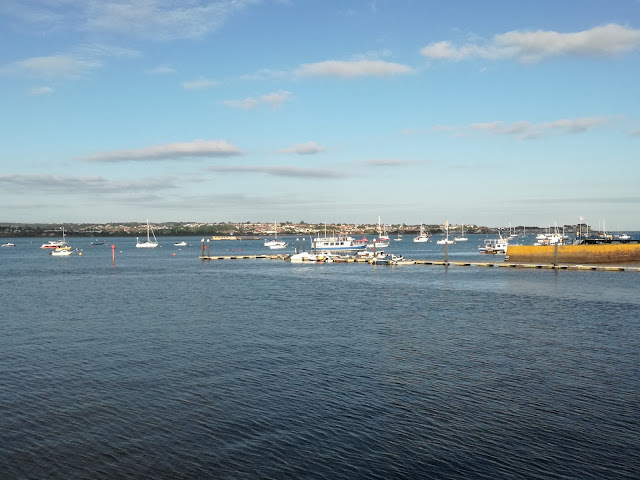 I wanted to spend some time at Starcross, a lovely location on the Ex estuary, but although one stop up from Dawlish Warren not many trains stop there so I had to go via Exeter St Davids once more. A single car 153 was my train, and it was without doubt the most comfortable train of the day. All new train seats should be modeled on this unit! 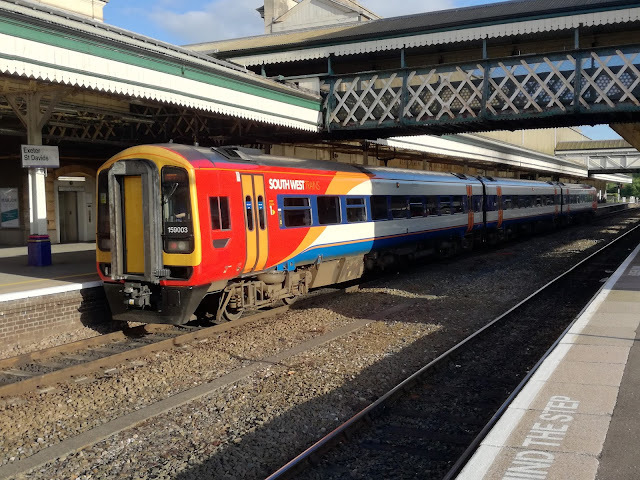 While at Exeter I managed to snap one of SouthWest Trains class 159 units about to depart for Waterloo. Now First have won the franchise this livery won't be seen for much longer. I just hope whatever replaces it is just as striking. 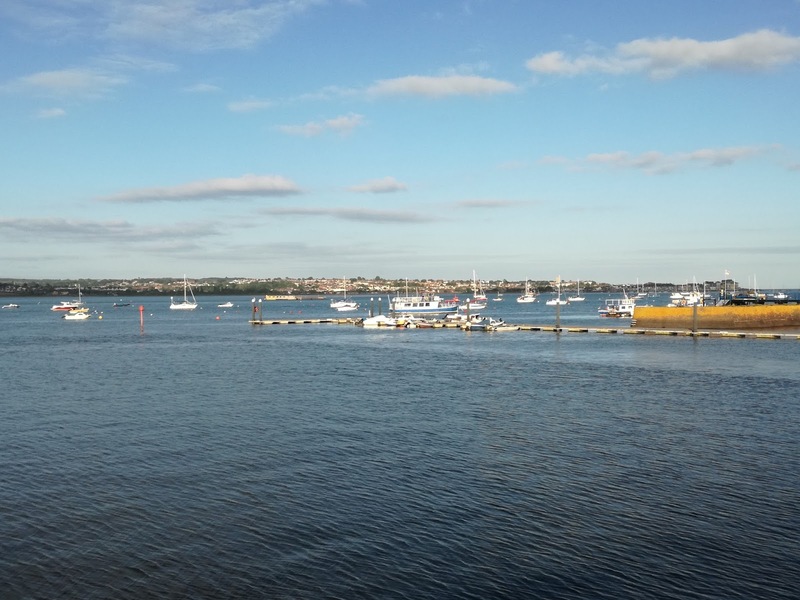 So to Starcross on a 150, and the weather didn't disappoint me. A glorious evening at one of the most glorious places to watch trains. 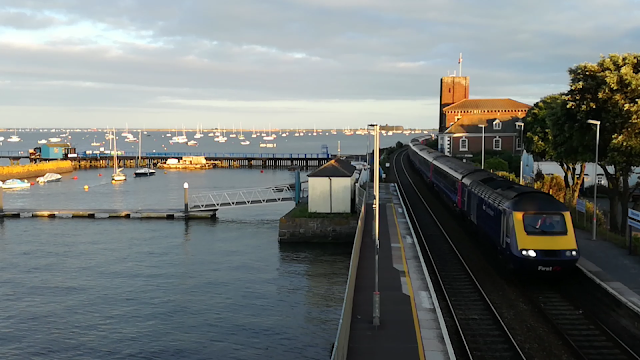 The results of my hour at Starcross can be seen on the video but this will give you an idea! I caught the next train back to Dawlish for tea, which happened to be an HST. I have to say at this point that HST's on the inside could be any type of train, and are iconic to look at only. I think people who like watching them will be sadder to see them go than those who regularly travel on them. By now my feet and legs were seriously suffering and I was delighted to see buses still running at 10pm so caught one to Newton Abbot where the driver, bless him, flagged down the bus to the station (saved me 2 footbridges). The last train to Plymouth came in, which was the Welshman set. I cannot describe just how bright the interior lights are in those refurbished coaches. Totally unnecessary and makes seeing anything outside when dark impossible. GWR take note when designing the new trains. A stagger back to Plymouth coach station and I was soon back on the coach to London. Where I was faced with a problem. I had booked myself on the 1300 coach back to Norwich to allow time in London but I was exhausted and my legs were killing me. So I checked out how much extra it would cost to get the earlier 0930 coach. 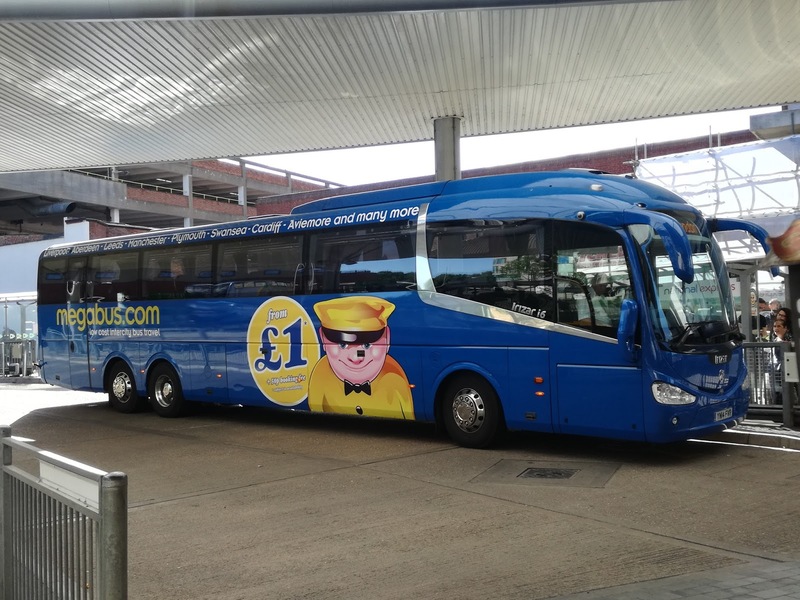 Megabus told me £10 which since I'd only paid £1 for the 1300 I thought a bit much. Mind you Greater Anglia wanted £45.50 for a turn up and go single. So I checked the website to see how much a new ticket would cost on the 0930 coach. £4 later I was happily sleeping on another Scania tri-axle back to Norwich. A brilliant trip, one I'll definitely do again only with better footwear. 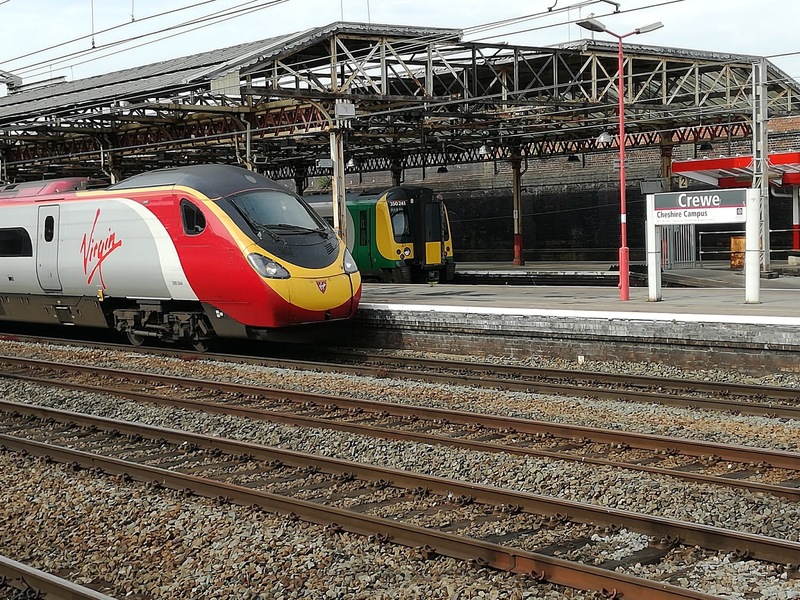 This week I'm on another 48 hour trip, this time to Crewe, Carlisle, the Cumbrian coast, Settle & Carlisle line and York. Reports and I hope spectacular pics over the weekend. In the meantime here are the Devon vids. Enjoy. Boredom can be a problem. It can lead you to do things that seem a great idea at the time. 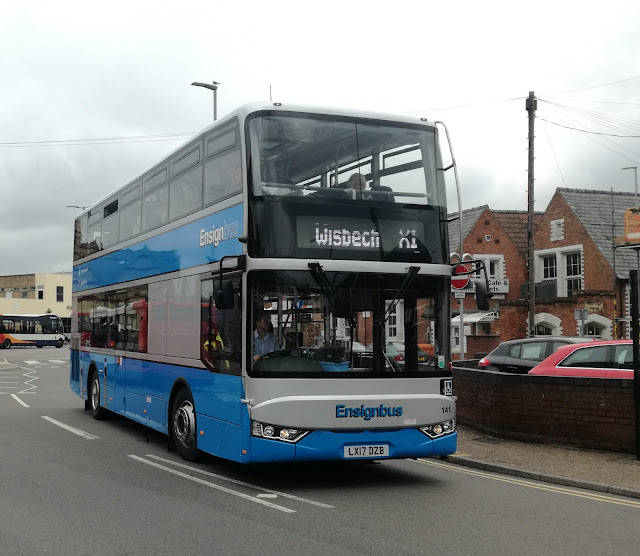 Such an event happened over the Easter weekend, when I decided it was about time I caught up with the MAN Ecocity gas buses rudely snatched from Anglian and dispatched to Plymouth last October. Some perusing of the Megabus website and I came up with a package I couldn't really refuse. Travelling Norwich - Plymouth on the Sunday, arriving in Plymouth early Monday morning, all day there before catching the overnight coach back to London and on to Norwich to get back Tuesday teatime. All for £10.50. Yes Norwich to Plymouth return for £10.50. 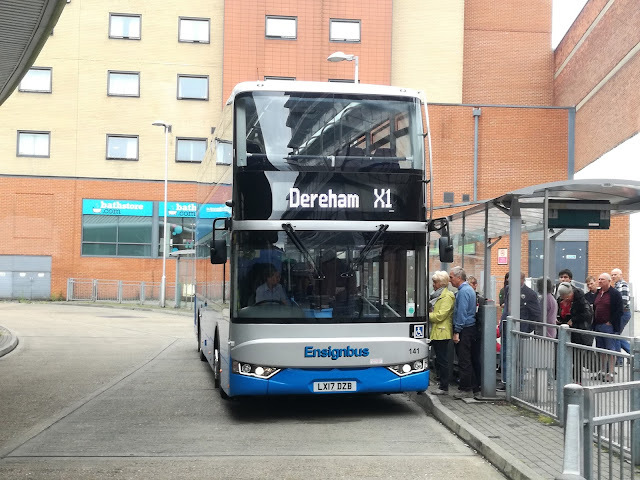 It seemed rude not to so I booked and thus Sunday afternoon saw me catching one of Anglian's long term loanee Mercedes Citaros to Norwich to begin my journey. A routine trip to London on Freestones superb 14 plate Scania Izara tri-axle followed, getting in early as expected due to Sunday timings being the same as weekday. This allowed me time to do something I felt I had to do. 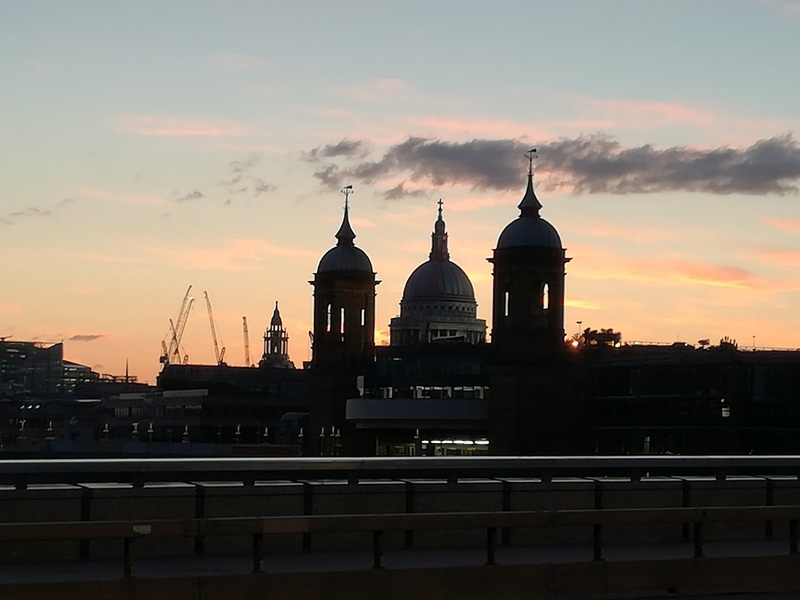 I can't tell you how many times I have stood on London Bridge, driven over London Bridge, stopped on London Bridge or passed through London Bridge going over Borough Market on the train but it will be in the thousands. It was important to me that I went there again to pay my respects to those whose only offence was to be in the wrong place at the wrong time. A chat to a friendly copper allowed me to place events, and in the middle of an incredible sunset I stood by the tributes with that iconic view of Tower Bridge and tried my best to imagine the horrors of 8 days previously, and it isn't easy to equate the images you see on TV with the spot you know so well. The trip to London Bridge allowed me to get a ride on one of the Wright bodied Hydrogen buses running on the RV1 Covent Garden - Tower Gateway route. A few interesting whines but they're not bad, certainly better than the BYD electric buses. 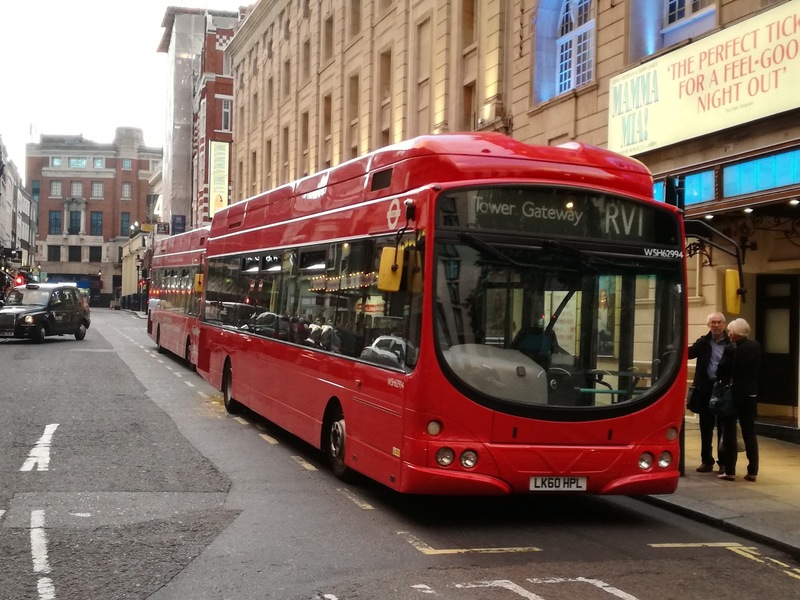 However, a well respected source then informed me the hydrogen buses cost a million quid each and my estimations lowered a little. Yes they're ok but under no circumstances do they look, sound or feel a million quid. No wonder they haven't caught on. A million? Seriously? 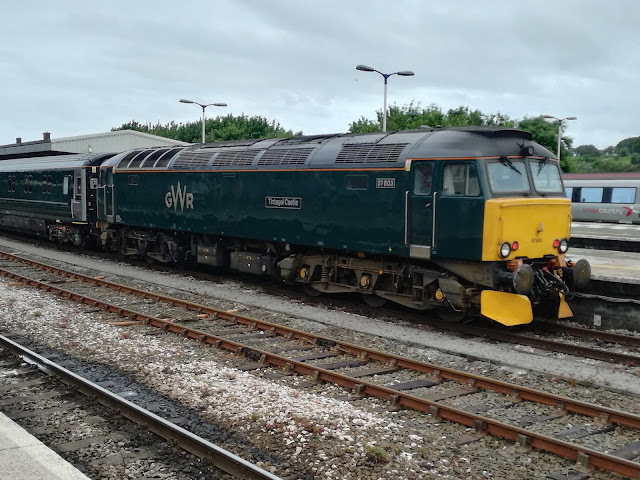 A couple of Borismasters back to Victoria made me feel better and I joined the merry throng waiting for the 2330 to Falmouth & Newquay via most of the South West! A 66 plate Volvo B11R Plaxton Elite Interdeck duly arrived and duly filled up to the seams! It was heaving, which I wasn't expecting on a Sunday night. These are truly quality vehicles and I love traveling on them. Impossible to get a decent pic of it, either at London or Plymouth so apologies for that. 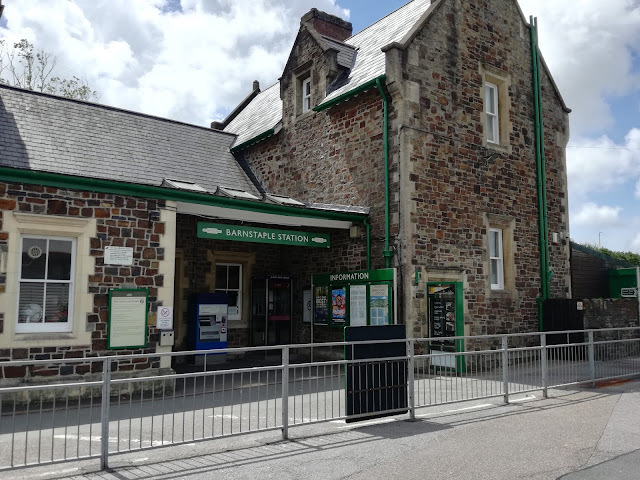 We were a bit late arriving in Plymouth, which didn't matter as the City really hadn't woken up, and I decided to locate the Rail Station immediately as that would play a big part in the day. Naturally it was uphill, but a 15 min walk later and I was at Plymouth Station with something unexpected (mainly because I hadn't researched) at the platform. The Sleeper from Paddington to Penzance was on a scheduled stop, and I took advantage of the situation. 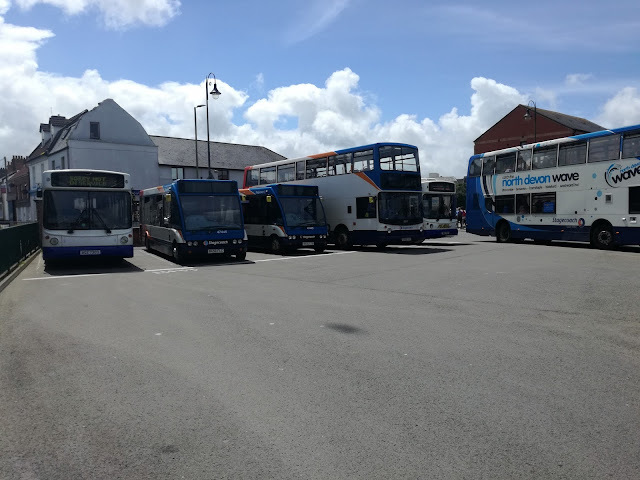 A good start to the day, but it was time to catch up with those gas buses, and as luck would have it one of their regular routes passes the station, so I waited and before long ex Anglian 109, now Plymouth Citibus 701 AU62 DWC arrived. 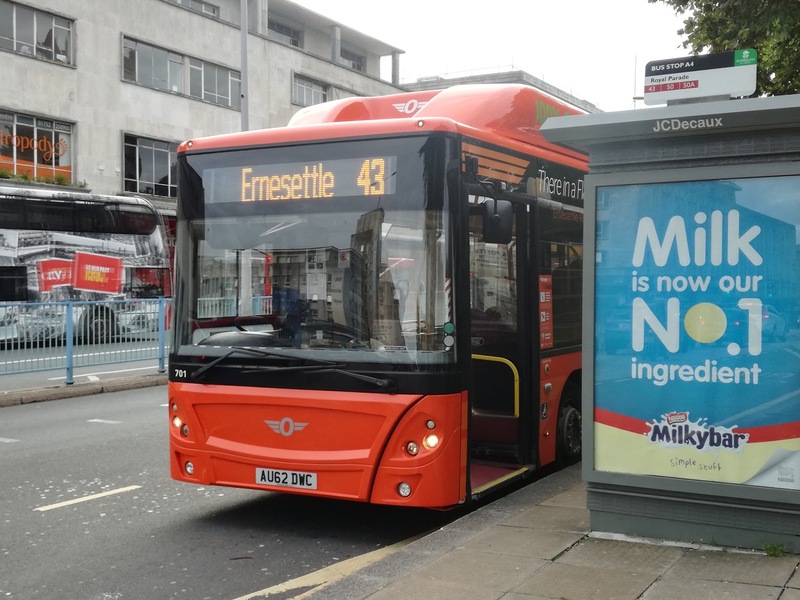 A day ticket on Plymouth Citibus's extensive network is a mere £4 - something Go-Ahead in this region might like to contemplate. £9 for a much smaller network doesn't compare well. When they took them Plymouth Citibus intimated that the gas buses would get a decent overhaul - seats re-covered, panels tightened up etc. Well they've had a repaint. Nothing else has changed. Seats the same, rattles the same, door alarms going off when cornering right the same. I mean yes they are still brilliant and the best single deck bus ever built in my opinion, but there was no evidence of the extensive TLC I was led to believe they were getting. 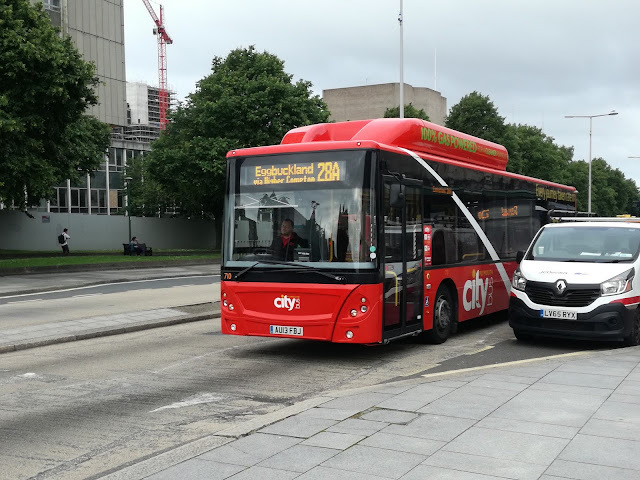 I took a pic of ex Anglian 110, now Plymouth 710 AU13 FBJ, and rode back to the station on ex Anglian 105, Plymouth 705 WX62 HFU but was left with a real sense of anticlimax. Let's see what they are like in another year. The rest of the day was to be far from anti-climatic. One of the jewels in the railway crown is the Devon Day Ranger, which covers the Great Western Main Line from Tiverton Parkway to Plymouth, and all the branch lines - Exmouth, Barnstaple and my first port of call, Gunnislake, and all for £12. Better still, although not normally valid until after 9am, because the Gunnislake branch isn't that regular I was allowed to use it on the 0840 departure from Plymouth. Part two will be dedicated to my day on Devon's railways, and how I'm still suffering for my pleasure!